I'd go for fence. Yes, they can jump a 5 foot fence if they want to. But, they really need to want to to make it worth their while. I've had my garden fenced in, and I jump deer around it regularly, always outside the fence. They've never once been inside it. I use the green metal fence posts (as they're the easiest to install) and 2x4 welded wire. I've got 4' fence in some places, and 5' in others. The important part is to get tall posts. I have 6 feet of post sticking out of the ground, so I run a piece of twine around the top of the fence perimeter, effectively giving a 6' fence. You probably could find something cheaper than the welded wire fence too, though I don't know. Maybe the plastic fencing is less? Something else? It doesn't really need to resist a deer running into it necessarily, just act as a deterrent. The other thought is to plant a thick hedgerow, but, that would take lots of time to wait for it to grow high and thick enough, and lots of $$ to get it started anyway. Fences would definitely work, but I hate to build hundreds of feet of fence (and the associated gates) for no purpose other than keeping deer out. That's what I love about the chicken moats --- we build fences...and get eggs! 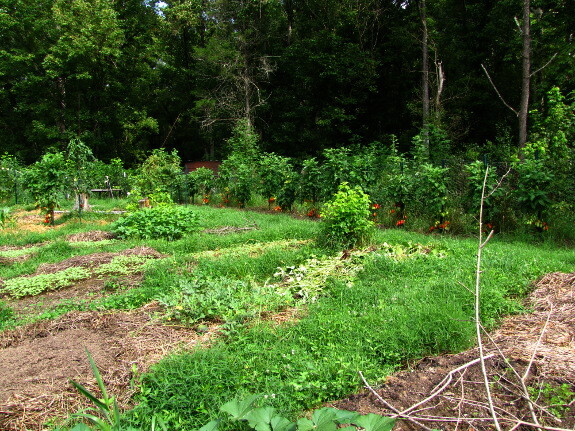 I'm hoping there are other permaculture solutions out there like that, but that are more compatible with the well's groundwater safety requirements. have Mark "mark" the perimeter every 10 feet. The scene from "Dances with Wolves" comes to mind. 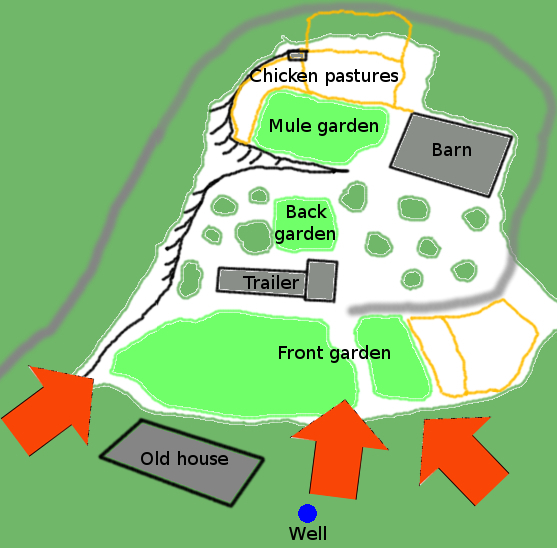 A good alternative to a fence would be a real moat; dig a 2-3 feet deep trench (save the grass turf), and deposit the soil on the inside as a dike, making the slope between the moat and the dike as steep as possible so the deer cannot just walk up it. You should probably stabilize the sides of the dike with grass turf. Of course this is best done with a digger if you want it done quickly. Another solution is to build a woven hedge in the english style, using plants that the deer don't like. Of course that will take probably several years to grow big enough and twine. It will probably cost you relatively little effort. Hi there. I'm up here in Alaska, so I really have no experience with deer. Just moose. And moose don't jump, so fences work well. Anyhow, that being said, I do have a couple thoughts on your deer issue. I would launch a two (or three) pronged attack. First of all, it appears that the deer are hitting your southern gardens closest to cover and a quick getaway. Why not give them an alternate food source? Make it easier to get to, and tailor it for the deer. It looks like a great big field of clover would do fine either back in the trees by the well or just on the edge of the trees surrounding your property. Clover has three qualities at least. 1. Bees love it - would help your beekeeping endeavors. 2. It's edible, and 3. it's low maintenance. If you really wanted to get ambitious, you could even add a deer feeder at one end of the clover patch. Second, you already mentioned hunting. A little venison in the freezer never hurts. However, you also mention that the deer in that area are "managed" by fish and game to provide for sustainability or even growth of the population. This is where the third prong of the attack comes in. If you and Mark cannot cull enough deer from the local population by yourself, why don't you enlist some help? You could contact your local traditional archery club and invite one or two of their members (that you approve of, of course) to hunt your clover patch during deer season. Trad archers are, in general, very ethical and respectful of land ownership. Bows are quiet, so you don't have to worry about gunshots at all hours of the day, and an average shot for a hunter with a recurve or longbow is about 20 - 25 yards as opposed to modern compound bows with a much longer range. You would also endear yourself with the local hunting community - and probably get some additional venison for your freezer with no work. These are just ideas, and I am by no means an expert. Instead of looking at deer as pests, turn it around and look at them as a resource. If I'm not mistaken, that is the essence of permaculture. What about a dog that stays out and roams the property? I would think that would deter the deer. The barking and presents of a dog should keep them away. Everybody --- I was considering posting this on Mark's deer blog, where it's more relevant, but I decided to put it here instead in hopes of getting some good advice. I'm so glad I did! Those are some very thought-provoking suggestions. Human Pee I've poured so much pee around the perimeter that you'd think the weeds would die. Human urine seems to have absolutely no repelling properties in our neck of the woods. Dog We have a dog, and she does a good job of keeping predators out of our homestead. However, our experience with dogs (which involves talking to lots of other people around here who have tried to use dogs to keep deer out of the garden) is that dogs will be vigilant for a little while, then realize that deer are neither easy to catch nor likely to harm them. Unless you're willing to get an additional dog every six months or year, dogs won't keep the deer out of your garden. Local Hunters I so wish this idea worked. We've tried letting various people hunt on our land, and the unfortunate truth is that people around here are sport-hunters who aren't very interested in those does I really want gone. I have to put up with people in my personal space (yes, the whole 58 acres is my personal space ) for a week or two, and the hunters almost never get a deer. That said, I think Colin is spot on with his comment that the permaculture approach to deer is not to consider them pests, but to find out how they're an asset. And the obvious way they're an asset is by providing meat. Which means I just need to become a better hunter! Real Moat Roland --- Your moat as envisioned doesn't fit the multi-use goal, but it did spark some related ideas while I was weeding this morning. If the terrain was a bit more amenable to it, I love the idea of a pond as a deer barrier since we could use it to grow fish and soak mushroom logs. Too bad that part of the yard is the worst spot for a pond. Food Plot I've always been leery of the food plot idea, so it's the one mainstream anti-deer measure I've never tried. My gut says that putting yummy deer food anywhere near my garden would just tempt the deer to hang out here more often and thus make inroads into the plants I care about. That said, I did notice last fall that the oat cover crop that I planted on the troubled southern border got nibbled but the deer didn't come in any further. I thought of the oats more as a "trap crop" for deer (well, in addition to being a cover crop), hoping that if the deer only entered the garden briefly, they'd eat those leaves instead of my precious strawberry leaves. The idea merits more pondering. Perhaps a trap crop used in combination with some other sort of deterrent? Edible Hedge I've been intrigued by hedges for a while, but haven't come up with any plants that are both impenetrable to deer and provide useful human food. There are some marginal plants like roses (hips are edible but not delicious), blackberries (tasty fruits, but deer can get through the patches), etc. But this is one of my favorite ideas, so I may need to do some research and see if there are some good anti-deer, pro-human hedge plants. You have the right idea. Path of least resistance. This is how hunters move deer to get them in close. Block paths you don't want deer going down with brush and limbs, then funnel them towards your hunting location. Food plots and feeders are for bringing in more deer, by supplying these your population will increase and cause you more grief. Fencing is best. Don't need gates. Just by boxing in areas, it causes deer to think twice. They don't like not having an escape route. Parallel fencing along both sides of a drive works almost as good as a gate. Think farther away. Your deer don't seem to be targeting you, just happen by for a snack. As a hunter we try to think of where deer are coming from and going to: food, bedding areas. Then try to funnel them toward us. You can do the opposite. Erich --- You are exactly the kind of hunter I wish I had going after deer on our land! (Actually, I wouldn't mind being an apprentice to a hunter like you also. ) Your analyses of the deer psyche seem spot on! I see what you mean about not needing gates --- in essence, that big opening on the west side of our homestead is a gateless gate, making the deer have to walk between two impenetrable areas (the barn and the chicken pasture) to get to the food. That makes so much sense! I'm glad to hear someone with so much experience mirroring my gut reaction about food plots. I'll take them off the table for good. I also love your point about thinking further away. There is a regular deer path that goes up the southwest side of our homestead --- no wonder the deer drop by from time to time to nibble. It sounds like Mark's gut reaction --- to make a chicken pasture go across that path --- would be very helpful. Okay, back to the drawing board!! We have some deer that visit our area year after year, but since we are now in city limits hunting isn't an option. In our flower beds, we have been careful to chose varieties that deer are not interested in. They will still eat the tulips in early Spring, but I think that it is because the others haven't grown up and distracted them with different smells. Deer have strong habits and will come back to the same areas once they know that they can find a good food source year after year. The key is to break that cycle or prevent them from establishing it in the first place. We had problems with deer getting into the garden and chicken feed. Even putting our dog run next to the garden didn't help. (It is interesting how the dog will go crazy around strangers but ignore deer) What helped us was to install tall t-posts (8 foot) with inexpensive deer netting. The plastic netting is light-weight and tears, so the best effect is a visual deterrent. For the most part, you don't have to actually prevent a determined deer from getting through, you just need a visual cue that they can't easily jump over or get around. (They will break through a strong barrier if they are being chased or startled.) I have seen deer jump through small holes in fencing five feet in the air, so the visual deterrent needs to have openings small enough that they would perceive that they can't get through. I'm wondering if a tall fence posts strung with twine every few inches would make a difference. You could use it to train vines to grow up and provide an additional barrier. I really like David's comment about using twined posts for growing veg. If you went ahead and used chain link I have seen gorgeously enormous success with people vertically growing pumpkins, winter squash, hops, grapes, etc on the strong chain link. However, even just using the twine and growing lighter vine crops all along that barrier would be extremely useful, yet a barrier every year. It's certainly the option I'd go for if it was financially in reach. As for useful, living borders, I found several interesting plants that were double-duty. The 'cranberry' viburnum was a very interesting one because their pretty red berries are very similar to cranberries and apparently make an excellent cranberry jam, so maybe that's an option. You could consider raspberry borders that run along as a fence, as well, instead of blackberries. The key, of course, is to not make the gaps through which the deer would risk coming. So if you put them up fence-style instead of sprawling patches, then you should achieve your goal and have lots of useful plants. A mixed bush border of blueberries, currants, rose, etc, would also provide edibles and a barrier all-in-one. This does bring up that fact that some choices will take longer to grow together than others, but considering your patience and efforts with deer up until now, another year or two may not, ultimately, matter. As I mentioned above, just putting in fences doesn't make sense for us. Since our growing area sprawls out over perhaps half an acre or more, fencing it in for no purpose except keeping deer out is just too much time and money for too little reward. That's why we're looking into more permaculture solutions. It seems to me that when you were living with me you and Magie were able to put up a low cost "fence" around your garden that kept the deer out. Would something like that be possible using downed small trees for posts and then large downed branches for a 3-D effect. Just remember that here the rabbits and ground hogs got in! I distinctly remember my spiderweb fence (and wish I'd taken a picture of it. ) But what I remember is that it didn't work. Maybe that was just due to smaller critters coming in? The fencing problem still remains the same, though. 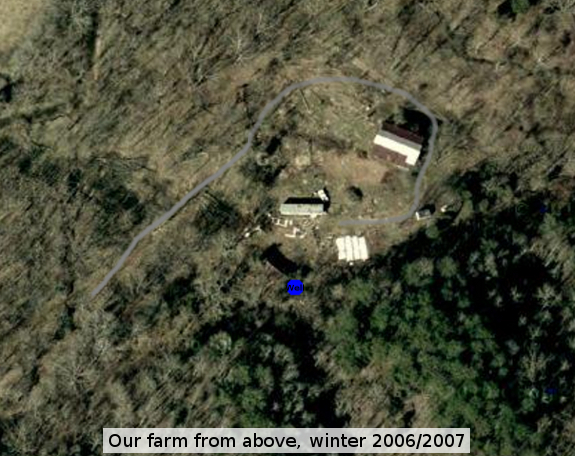 I was fencing in a little lettuce bed, which is several orders of magnitude smaller than our current area. Yes, it was the rabbits and ground hogs that got in as you did not think they would be a problem. Wrong!! You might want to put a two foot fence of some sort, maybe some wire, to keep the smaller critters out. Luckily, Lucy does her job with the small herbivores. I've only seen a rabbit in the garden once, and it was running so fast, zigzagging through the garden with Lucy right on its heels!! I don't think she got it, but it didn't come back. I've been reading about Osage Orange trees, and apparently they were widely used to fence in livestock before barbed wire came about by palnting them closely in rows and weaving the thorny foliage together.. Maybe another option for a natural fence? I've explored osage orange hedging before, even though they don't really fit the bill for being multi-purpose. My experimental hedge-laying didn't work, but I think I probably should have started the seeds in a more controlled environment where I could give them love and then transplanted them. Osage oranges are a great tree for living fences! Deer hate to eat them too:) as for multi purpose the wood makes a great firewood and superior fence posts. A good load of hedge can fetch a premium price, currently 180 dollars a cord here. the fruit is sometimes eaten by livestock although inedible by humans. However the balls do keep all kinds of bugs out of your closets and basements! Ebay currently has hedge apples forfive bucks a piece and a tree can produce many. a row can be quite me ssy. Just wanted to add my two cents, there may be a better option but for ease of planting, upkeep and uses it's hard to beat a hedge apple! I actually played around with making an osage orange hedge. Despite all of the reports on the internet, I didn't see a single plant come up, which suggests you need to give the seedlings more love than I did (which wouldn't take much. If you have a source of bamboo you can build a shorter fence and tie bamboo poles diagonally along the fence to extend the height. The length and bushy tops will prevent the deer from jumpimg over it. Deer are also deterred by the sound they make as wind passessthrough them. This is a very cheap and quick way to make a 10' fence that uses no plastics only a fast growing renewable resource! What about sea buckthorn? Nitrogen fixing, really thorny and with delicious berries which can also be made into a super healthy oil. In Gaia's Garden, the author (Toby Hemenway) planted a thick hedge of mixed prickly species to deter the deer, then grafted related edible species on the inner side. Placed parallel to the deer path, would move them on past easy entry to your garden. Biggest drawback? Time for growing.